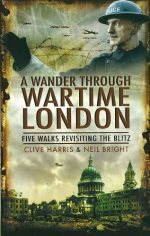 We are pleased to welcome Neil Bright, historian of London’s Blitz as our contributor. Here he tells us the story of the first day of the Blitz and its impact on SE16. 7 September 1940 was to be a fateful day for Rotherhithe’s Surrey Docks. For many families on that day, their lives were changed forever. Hitler was now knocking on Britain’s door. He was making preparations to invade England but for the moment, 22 miles of English Channel kept the door locked. Germany needed to defeat the RAF’s Fighter Command to attempt any such invasion so a hard summer of aerial combat followed. Convoys, airfields, radar stations and aircraft production were all attacked to tease the RAF fighters into battle. 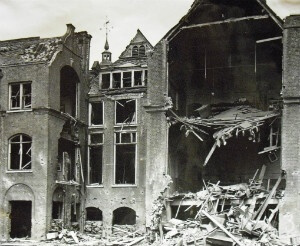 Hitler had always forbidden the bombing of London, but on 24 August 1940 in poor weather, a lone German bomber dropped its payload in error on Fore Street in the City. The RAF bombed Berlin in reprisal. Hitler was incensed by this action and immediately ordered the attack on London. That Saturday was a warm, sunny late summer’s day. The men were looking forward to the Millwall-Charlton game at the Old Den. 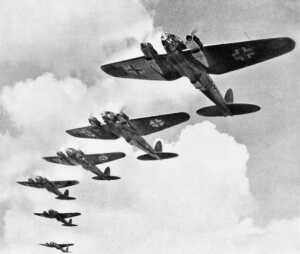 At just after 16:30, 350 German aircraft appeared over the Thames Estuary, heading towards London. London’s docks, West Ham power station, Beckton gasworks and the Woolwich Arsenal were their prime targets. The onslaught was murderous and the instant damage widespread; much of the East End was soon on fire, as were many riverside warehouses. 200 acres of timber was burning furiously on Surrey Commercial Docks. The fires could be seen from as far away as Guildford. 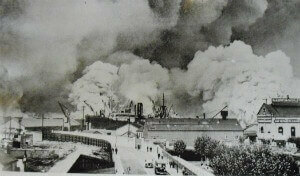 The lives of Rotherhithe’s community were in grave danger as the blaze increased in intensity. Both access roads to the docks had been hit and the damaged blocks of tar caught fire too making the routes almost impassable. Fire Brigades were scrambled from across the Home Counties, including the Auxiliaries. In many cases the Auxiliaries proved ineffectual as hoses did not fit local hydrants. ‘Downtown’ was in particular trouble. People were evacuated across to the Isle of Dogs from the jetty just by the Smallpox Receiving Station [Ed: now the Surrey Docks Farm site]. William Petley, council mechanic and Great War veteran kept a cool head; he helped the evacuation and stayed on to help fight the fires. It started in the afternoon on the dry dockside. And then it sort of went in a circle. They dropped tons of these incendiary bombs. Behind the flats where I live we were throwing sand on them and we were only kids. Then all of a sudden, evening-ish, as the fire came either side, it seemed to cause a whirlwind; all of the curtains in the flats went up…It got worse and worse, so we had to evacuate. Women’s Voluntary Service (WVS) member Grace Rattenbury drove her car down to those trapped near Sunderland Wharf; she then ran a ‘shuttle service’ to Keetons Road School [now near Bermondsey tube station], being used as a rest centre. The trips Grace made with her beleaguered passengers were fraught with danger. Bombs were still dropping, the road was pocked with craters and fires were everywhere; the heat from these blistered the body of the car. Grace won the George Medal for her bravery. 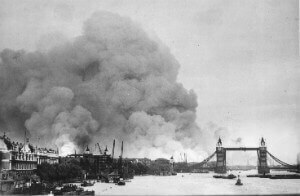 Some 300 bombers returned just after 20:00, pouring still more bombs into the existing fires; their way at night was lit by the orange glow over London. Both sides of the river got a repeat dose. It was going to be a long night! At Keetons Road Rest Centre, Joan Creed and her colleagues were settling in new arrivals. Most had come from Surrey Docks and many from Acorn Walk. Just after midnight two massive explosions rocked the centre within minutes of each other. Several centre workers were badly injured and shelter helper, Robert Marshall was killed instantly. Joan picked herself up from the first blast and started stretcher work with a young soldier. The second blast knocked the soldier on top of Joan. They picked themselves up and carried on. Joan then became a temporary ambulance attendant as the injured were ferried to St Olave’s Hospital in Lower Road. Joan herself was injured by shrapnel in her leg and forced to stand down against her wishes. Annie Lakin was one of 39 people who lost their lives at Keeton’s Road Rest Centre. I took a family to the site of the school last summer. The father, Roy, was in his mid-seventies. As we approached the site of where the Rest Centre was, Roy said to me “I was probably here, you know? I was two years of age and don’t remember it. My mother was Annie Lakin.” I left the family on the spot for a few minutes of reflection. In London, the Blitz officially started on 7 September 1940 and went through several stages until peace in 1945. By the end of the war nearly 30,000 Londoners had lost their lives. In Bermondsey 701 people were killed. People became widowed, orphaned, lost their children as well as friends and relatives. People also lost their jobs and their businesses and had to move on. People moved away from London during the war, not just with the evacuation at its onset. Many never returned, although some did stay or return to rebuild their shattered lives. In 1931, Bermondsey’s overcrowded population was 111,542 and 20 years later in 1951, it had dropped 46% to 60,640. Gone were the old certainties. New towns, new prospects and new beginnings offered new possibilities and new hope.